With the White Castle® gift card, whether it’s sliders, sides, or breakfast, you can fulfill the anyone’s (including your) cravings! From the Original Slider® 100% beef patty steam-grilled on a bed of onions to their delicious Chicken and Waffles Slider, lightly breaded chicken breast with country gravy and bacon crumbles, all nestled between two Belgian waffles, we can satisfy anyone’s craving. Or, try our Mozzarella Sticks, or better yet, dessert on a stick to top off your sliders. Whatever you’re craving, we can satisfy it. White Castle’s gift cards and egift cards are always easy to order, are available in plastic form, and can be used at participating restaurants only. National Gift Card is the best place for you to order White Castle gift cards in bulk. We are the experts in all things gift cards and can set up your gift card solutions program for you today. Please contact us for more information on White Castle’s bulk, direct-to-recipient, or individual gift card fulfillment for your gift card program. Contact us online or call us at 888-472-8747 today! Visit Whitecastle.com to check your balance and to find the closest White Castle restaurant. 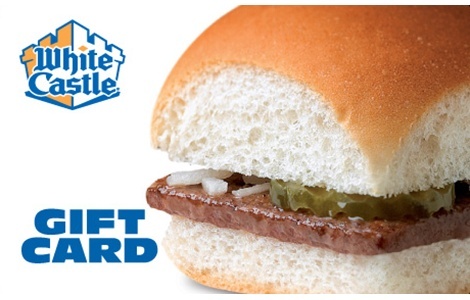 Go Green: please reload your gift card at your White Castle restaurant. The White Castle gift card can only be used to make purchases at participating White Castle restaurants in the United States. This card is not valid for purchasing frozen White Castle products in grocery stores or other outlets and cannot be used to purchase a gift card. This card cannot be redeemed for cash (except in those states that require redemption for cash) and will not be replaced if lost, stolen, altered, or used without permission.